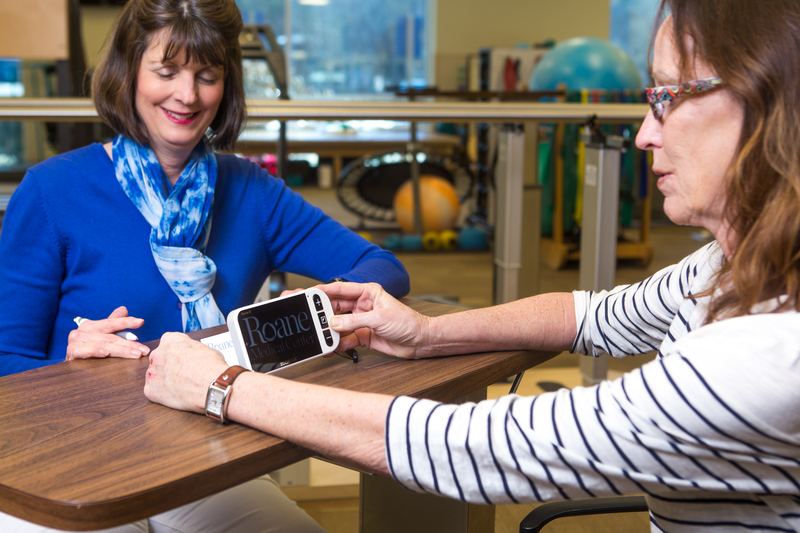 The Low Vision Rehabilitation Program at Roane Medical Center is administered by an occupational therapist with specialized training. The therapist works with the patient’s eye doctor to help solve everyday problems caused by low vision. Low vision is a visual impairment that cannot be corrected with glasses, contacts, or surgery. The visual impairment is severe enough to interfere with activities of daily living, however the client does have some usable vision. Patients with less than 20/60 acuity with glasses in the better eye, or a visual field impairment of 20 degrees or narrower qualify for the program. Occupational therapy helps people safely and accurately perform every day activities such as reading, writing, cooking,needlework, crafts, clothing organization, using a computer,telling time, medication management (including insulin injections), using the phone and money management. Therapy also includes training in visual aids and to adjust and control lighting. A technique called eccentric viewing can be helpful for certain clients with macular degeneration. Each treatment plan is based on the individual goals of the patient. Sessions are typically one hour, once or twice weekly for one month. Medical insurance, Medicare or Tenncare pays for sessions, but not for adaptive equipment such as magnifiers. Some insurance companies require prior authorization before starting treatment. A physician’s referral is necessary from an optometrist or an ophthalmologist. Patients are welcome to bring any personal magnifiers or devices they choose. Patricia Neal Outpatient Center is located in the lower level of the Professional Office Building at Roane Medical Center. For more information, call (865) 316-2950.